WordPress 3.5 has been just released – it includes some great new features, such as the new Media management screen in posts and pages, which allows creating galleries not only by using the current page/post attachment images, but the images from the whole Media Library. Implementing a new Media screen changes the way the images are added to some of the sections. Currently we are working on updates of our themes to update the instructions in the documentation, but meanwhile – until the update of your theme is released, you can refer to this article which explains the changes and how they affect our themes. 2. Open the “Create Gallery” section. If you would like to upload new images click on the “Upload Files” tab and upload the images. If you would like to add existing Media Library images, click on the “Media Library” tab and select the images you like. 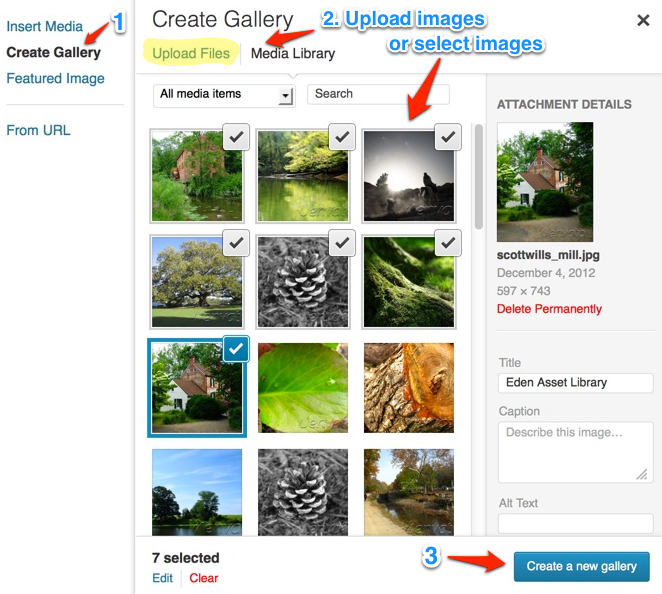 After you select the images, click on the “Create a new gallery” button. 3. After this when you click on each image in the gallery, you can set a title and description to it. In the “Link to” select “Media File” and in the “Gallery Columns” field select 5 if the page is full width or 3 if the page contains a sidebar. Click on the “Insert Gallery” button. When you edit the images from there and change their order, the changes get automatically saved – you don’t have to press any buttons in order to change them.